The Bushiroad Spring Fest 2016 Season has finally ended! 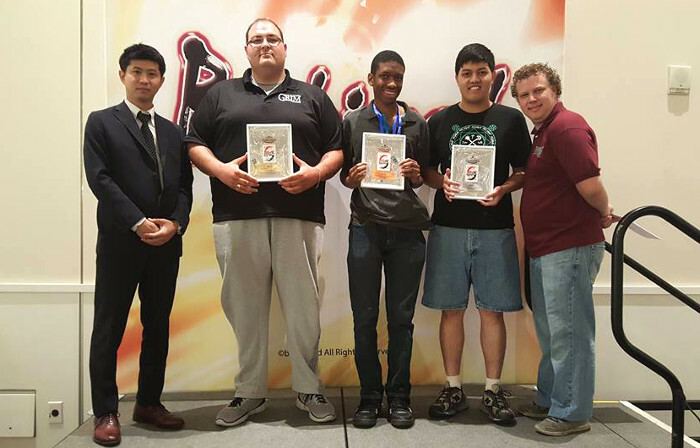 On July 23rd, top players from the Regional Qualifiers in North America gathered for one last time in the grand city of Pasadena, California to determine who will stand at the top of the North American Continental Final! At the end of the day, after rounds and rounds of intense fights, the Buddy Challenge Champion finally emerged! 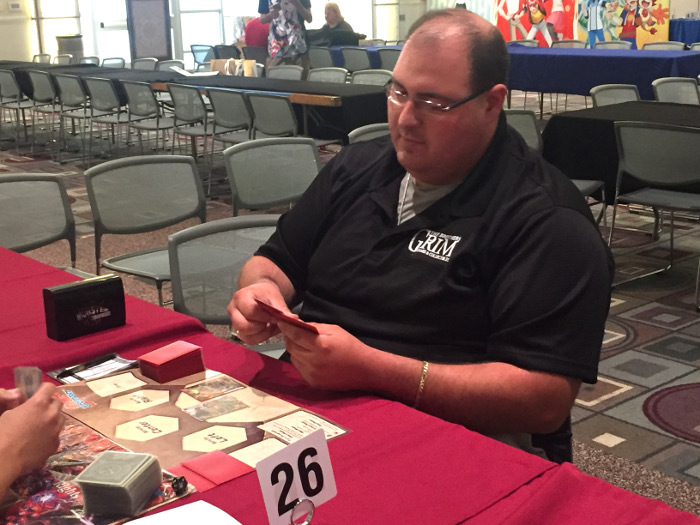 We had the honor of interviewing the BSF2016 North America Continental Champion, John David Muir! Now, let’s see what he had to share on his victory! Loves playing games, watching sports and hanging out with friends. A: It’s a first and it feels really awesome! A: Fighting Jackknife “Aster” was probably my hardest match, but I still had a great time with everyone. John David Muir in action! 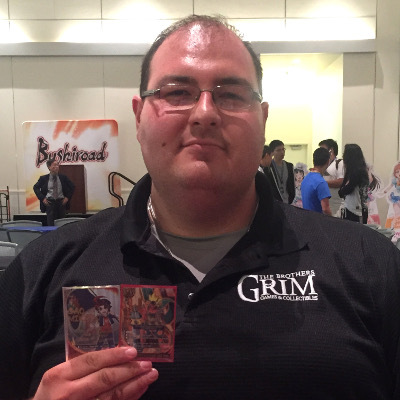 A: I used a Fifth Omni deck revolving around Drum’s abilities, hovering at around 6 or 7 life most of the time. A: Yes, every single time a new pack comes out I try to tune my deck. 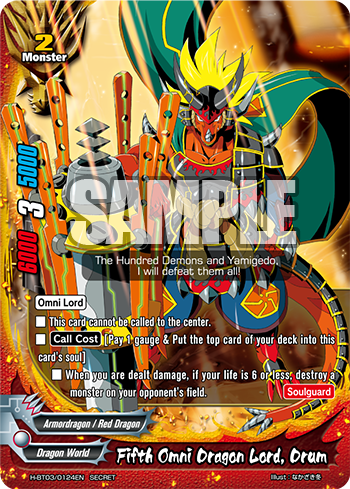 A: “Fifth Omni Dragon Lord, Drum“. A: I do watch the animation, but there isn’t a character I’d like to challenge in particular. A: Personally I like the individual format, but I think tag team would be fun as well. A: Feel free to contact any top players, or anyone in the community if you need any help. The community is really friendly and wants to support each other out in any way they can. A: I really enjoy the game. I would like to thank Bushrioad for hosting this event and I hope to see more people enjoying the game as well. 3rd Place: Kadeem Maxwell, 2nd Place: Nima Hosseini, Head Judge Zachary Higgins. Thank you for your time, John, and congratulations again on your win! 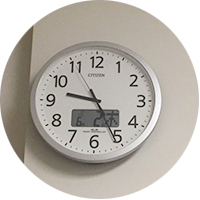 Hope to see you in our future events! 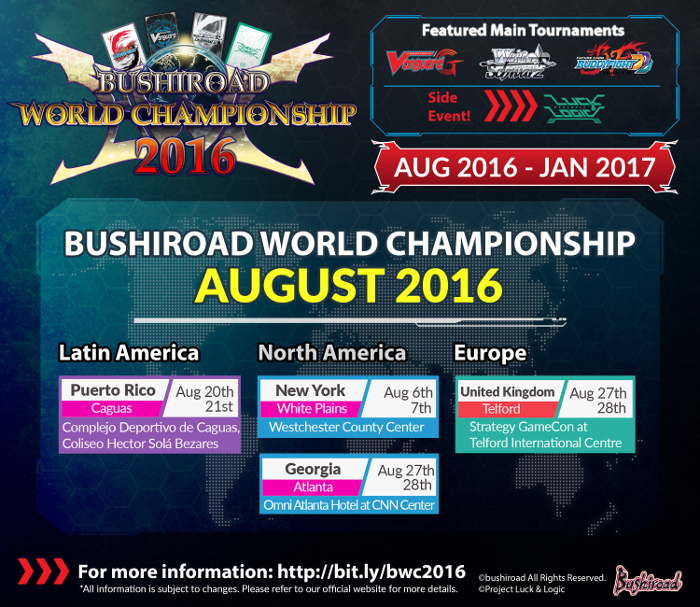 Another major circuit, the Bushiroad World Championship 2016 will also commence very soon, with the first qualifier in New York this weekend! Everyone get your decks ready! Do check out the event page and our Facebook page for the latest updates! That’s it for today’s article folks! The interview for the BSF2016 Europe Continental Final Champion is coming next week, so do look forward to it!